To be intuitive and useful, the connector should be configurable so that it can integrate with several online video management platforms. In our scenario, our marketing user could open the video “picker” component when building a page, perform a keyword search across several video repositories (including the native database of the CMS), select and append the video with additional metadata and publish. You can imagine the use case expanding to include authentication and authorization, perhaps limiting the available videos for the user to select from. So rather than a specific system to system integration, you have a system to function/service integration with built-in extensibility should that function or service rest with several end points. 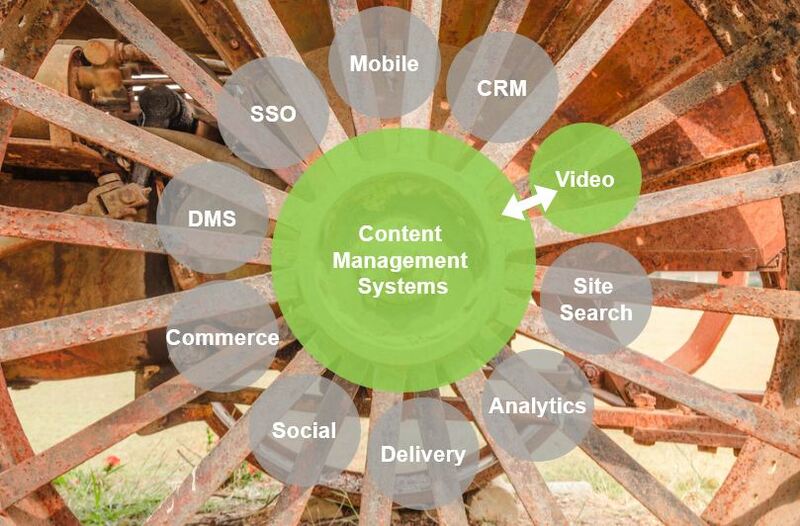 Therein lies the tradeoff / payoff balance, connectors must at least do the basics right (in this case connect your CMS with a video platform), but they can be so much more. Therefore, not all connectors are created equal and technology buyers should do their homework. More and more, we are seeing organizations seek efficiencies and economies in the content and customer experience management platforms. And nowhere is this more apparent than in large multi-brand, multi-region enterprises. Often a centralized team will drive core functionality and then offer that up via a library of components to brand or region-specific teams. The CMS and the components must be architected appropriately to enable reuse and some level of customization, since each brand and region within the organization will have their own preferred ways of doing things, unique page layout, specific requirements, and so on. To enable this vision, the core platform, components and any connectors must be flexible, scalable and extensible. The platform should be component based, so that a web page can be assembled modularly. It should have a modern integration architecture, preferable REST-based. It should allow for synchronization between regions, brands and the core system and provide centralized administration. With sometimes hundreds or thousands of internal users supporting global site traffic, these systems must also be performant and scale with minimal incremental investment. With these considerations in mind, Kanban has a dedicated team of technology experts focused on helping organization leverage content and experience management investments globally. We have built dozens of scalable, extensible connectors to leading content and experience management platforms. We’ve integrated those systems with CRM, mobile apps, eCommerce, DAM, social, document management, video platforms and more. Here are some details and a short demonstration of an integration between Hippo CMS and Brightcove.